The amount of light in a room is important to our customers here at Windows & More serving the Lake Ozark area. 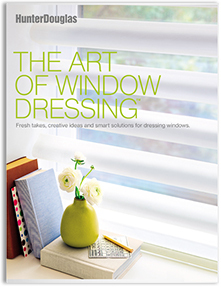 After all, for bedrooms or media rooms, many people want no light to enter from the windows, where in other rooms, they might want room darkening instead. Only blackout will provide total darkness, so customers need to understand their goals for the room. Are you looking to reduce glare on your TV? Do you want to just filter the light, so you can still see out? Or do you need the light totally blocked out in the bedroom to sleep? Hunter Douglas uses a scale of 1 to 5 to explain the opacity differences within their product line. Blackout means that no light will enter through the material. Look for a rating of 5. So, if you want to totally block out light, you might want to consider Duette®, Architella®, or Applause® Honeycomb shades in an opaque fabric. The silver metallic lining inside the honeycomb prevents light from passing through the fabric. 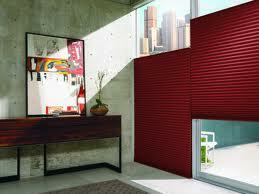 However, if you mount the honeycomb shade inside the window, you may have light gaps. Either adding blackout drapery panels or mounting the shade on the outside of the window to eliminate the light gap can fix this. Look for a rating of 4 or higher for room-darkening benefits. The key here is the fabric, material type, and color. 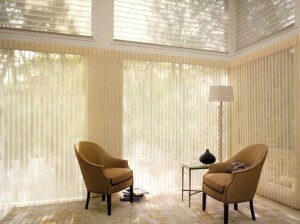 Sheer fabrics used in Silhouette® Shadings will soften and filter light, while semi-opaque and opaque fabrics found in Duette® Honeycomb Shades will darken a room, but do not necessarily completely eliminate light. The best thing is to know your goals for the room. Room darkening might work perfectly fine, but when the need for total darkness arises, your best bet is a honeycomb shade in an opaque fabric.